Stay cool this summer with these super hot Coronado Locals Card deals! 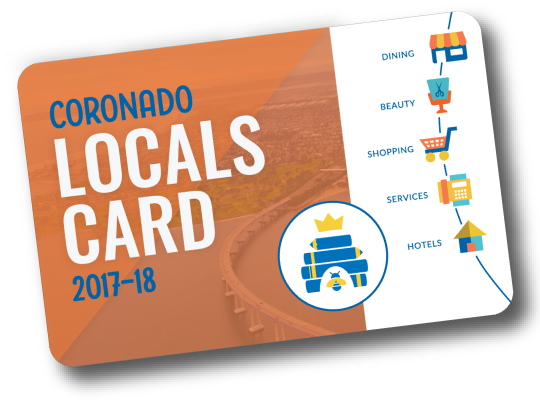 Supporters of Coronado Schools Foundation can use their Locals Card for exclusive savings all over Coronado. Check out these deals for cool savings all summer long. Learn how you can get your card and start saving today. One offer per table. Cannot be combined with any other offer or discount. Excludes alcohol. 10% off regularly priced merchandise everyday - 20% off Emerald City items. Half off rentals Monday-Friday only. 20% off all garden accessories and gift items. Take an additional 20% all wind chimes! Regularly priced items only. 15% off entire bill (up to 4 guests) Cannot be combined with any other offers/discounts. Excludes alcohol and merchandise.